Oceanspray, also known as creambush, is an understory shrub common in the Pacific Northwest and California, from sea level to 7,000 feet. 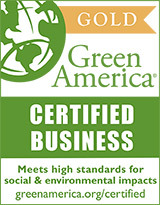 It occupies a diverse set of environments, from moist, coastal forests to arid mountains. Its can sprout from the root crown when the top is destroyed, so it recovers quickly in recently burned areas and is often one of the first species to send up shoots after a fire event. 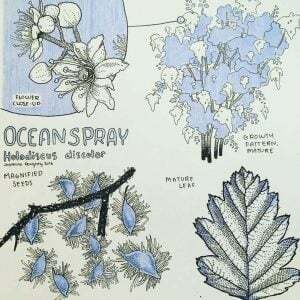 As a generally fast growing species, oceanspray is quick to colonize other disturbed areas, such as recently logged land. This species is common in early succession landscapes, but occurs regularly in all seral stages. This deciduous shrub usually grows 6-12 feet tall, and consists of multiple slender, branching stems with brown to gray bark. Its leaves, some of the first to emerge in spring, are small, alternate, and lobed. Oceanspray’s name refers to the profusion of long cascades of white flowers that cover the shrub from May to July, particularly where it grows in great abundance on marine bluffs. Terminal, plume-shaped clusters of tiny flowers emanate a sweet fragrance, attracting butterflies and providing food for honeybees. This plant is insect-pollinated and wind dispersed; the fruits are small (about 2mm long), dry, and hairy, each containing one seed. These seed clusters dry out in fall, and often persist in brown clusters into winter. Oceanspray acts as a minor browse species for ungulates and provides nesting habitat and cover for small birds and mammals. Individual plants rarely live for over 30 years, but are highly salt and drought tolerant and can shut down or slow transpiration rates when water is scarce. This shrub can also tolerate a wide range of soil textures, and grows in soil with pH levels from roughly 5 to 7.5. Oceanspray’s strong wood has historically been used by first peoples to fashion tools and furniture, including spears, nails and digging sticks. It is most commonly propagated from cuttings, as seeds are harder to establish. Collect seeds when the clusters turn brown- this is during October and November. As the seeds are very small (roughly 500 seeds a gram), they can be separated from non-seed material by rubbing the clusters over a sieve. Seeds should be kept dry and refrigerated while stored. Before planting, prepare the seeds by soaking them in fresh water for three hours. Drain water and place seeds in a freezer bag with pH neutral peat moss and stratify this mixture at 40 degrees Fahrenheit for 3-5 months, until radicles appear. Sow seeds shallowly, being careful not to overwater. They should germinate roughly 14 days after sowing with a success rate of around 50% and should be transplanted into individual containers at this point. Seeds should establish after 28 days. 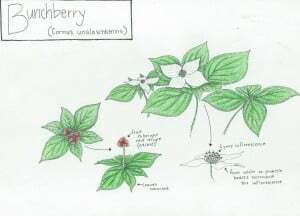 Bunchberry is the smallest member of the dogwood family. A perennial trailing groundcover with 4 to 6 whorled leaves, bunchberry spreads rhizomatously along the forest floor. It prefers to grow in shade on a thick layer of woody duff in the moist forests or bogs of the western mountains. With 4 luminous white petal-like bracts surrounding a cluster of small flowers in the center, bunchberry blossoms in late spring and summer. In summer and fall, bunchberry develops a tight cluster of red berries borne in an upright spray an inch above the foliage. Songbirds enjoy these edible berries, and various Native American groups harvested them as a food source. The narrowly ovate, pointed leaves of bunchberry feature prominent veins that curve and meet at the tip. In the winter, some of the semi-evergreen leaves turn red, adding color to the winter months. The plants themselves grow from 4 to 8 inches tall. Bunchberry blossoms are the fastest-opening flowers in the world, producing a small explosion of pollen. The blossoms open in less than 0.4 milliseconds–less than the time it takes a bullet to travel the length of a rifle barrel. The pollen’s initial acceleration is more than 2400 times the acceleration of gravity, producing 800 times greater force than astronauts experience during lift-off. This explosion launches the pollen 2.5 centimeters into the air, ten times the height of the flower! To watch a super-high speed video of a bunchberry flower opening, click here. Thanks to our employee, the talented Sachiko Goode for providing this month’s illustration. 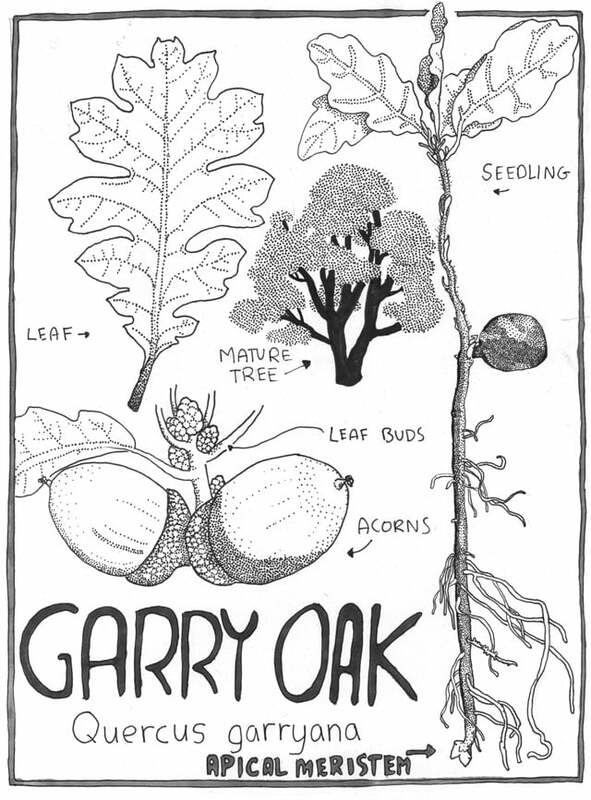 Quercus garryana, also called Garry oak or Oregon white oak, is the only oak native to Washington, ranging from California to British Colombia. It has lobed, deciduous leaves, and greenish-yellow flowers which appear in separate male and female catkins. First peoples traditionally used the acorns for food, eating them roasted or treating them using various methods to remove the bitter taste, then making soup or bread. Lumber from Garry oak was used in ship-building and furniture. Due to its strength and rot-resistance, Garry oak also was used as for fence posts. This is a slow-growing species, but it may live up to five hundred years and often reaches sixty feet in height at maturity. It is drought tolerant, and can grow in many types of soil, from gravelly prairies to seasonally flooded plains.Garry oak is often considered a dry site species, but it also grows along wetland and stream edges in close association with Oregon ash (Fraxinus latifolia). Garry oaks are most common on sites regularly disturbed by fire, and sites that are not suitable for taller tree species, as they are vulnerable to being over-topped and crowded out. This makes them an early successional, or seral species. They establish especially well with a frequent fire regime, as mature trees are fire tolerant and sprout vigorously from their trunk or roots after burns. Since settlers began suppressing wildfires, Douglas-fir encroachment has substantially reduced the extent of Garry oak woodlands, harming out not only oaks but the diverse set of species that depend on the oak woodlands, which include a variety of jays, woodpeckers, squirrels and other small mammals. Salmonberry is a deciduous shrub in the rose family. This shrub is one of the earliest to flower, and its vivid magenta blossoms can be observed right now. It has fine prickles along its woody stems, trifoliate, toothed leaves, and edible berries. The edible fruits are delicate and raspberry-like, with many drupelets, and they range in color from yellowish to rosy, pink-tinged orange. Salmonberry fruit ripen from mid-June to late July, with a juicy tart flavor that sweetens somewhat when they are about to fall off. Hummingbirds love salmonberry flowers. Many native mammals, such as elk, graze on its twigs, leaves, and buds, and the plant tends towards thickets that birds and smaller mammals can use as nesting habitat. Salmonberry shoots and berries are a traditional food source for First-Nations people in the Pacific Northwest, and the name derives from the traditional springtime pairing of salmonberry shoots with salmon meat or dried spawn. 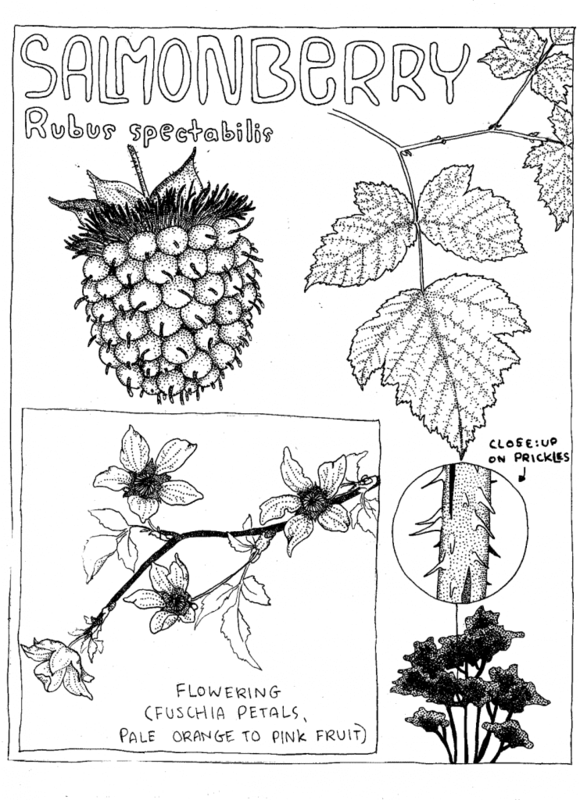 The Rubus genus also includes other edible berries such as blackberries and raspberries. Salmonberry prefers moist, forested areas in partial shade. It can be found from northern California up into Alaska, from low to subalpine elevations. Salmonberry takes well to disturbed sites, and its deep roots can help stabilize slopes and streambeds. It can be grown from cuttings and rhizomes as well as from seed. Grand fir is native to the Pacific Northwest from Montana to the Pacific coast and southern British Columbia to northern California, and it inhabits altitudes from sea level to 1800 meters. 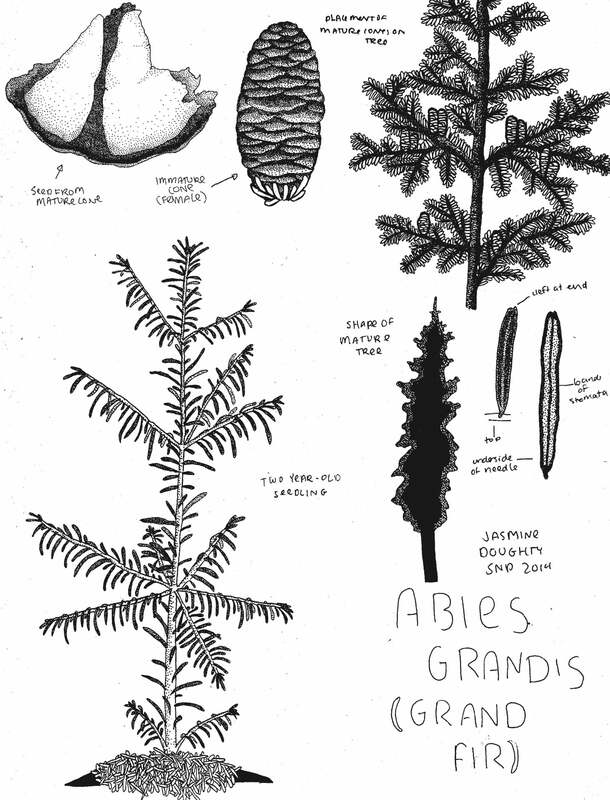 Unlike Douglas-fir, Grand fir is a “true fir” of the genus Abies. True firs have flattened needles with blunt tips, and they bear sticky, resinous cones that stand uniquely upright near the tips of the upper branches, unlike any other conifers. True firs typically occur at high elevations, and grand fir is the only true fir in the western US that occurs down to sea level. Abies grandis is shade tolerant enough to establish itself under a thick canopy, and once it breaks through the canopy, along with douglas firs, it tends to dominate late-succession forests in this region. Mature individuals usually range from 40-70 meters in height, and have a trunk diameter of two meters at the thickest. Leaves on this fir are needle-like and flat. The upper side of the needle is glossy dark green but the underside has two narrow, whitish bands of stomata that run lengthwise. Each needle has a miniscule notch at the end, on the same plane as the middle vein. Leaves are arranged on the branches in a spiral, but each leaf twists at the base, creating a distinctive appearance of two flattened rows of needles that seem to alternate between short and long. The mature crown is usually narrow and dense. This tree has both male and female cones- the male cones cluster underneath the needles, while the tall female cones stand upright above the needles and are much larger. When true fir cones mature, the cones shed their seeds while still borne on the branches, unlike Douglas-firs and other conifers. The seeds fall into the litter below the parent tree, where they spend the winter. During this time, the seeds stratify, which means that frost and weathering soften the hard seed coat so they may sprout. Because of this process, the seeds are not viable past their first spring. For current availability of grand fir, click here. The western Hemlock is easily identifiable by its drooping, conical top and similarly drooping branches. It ranges from 165 to 230 feet in height, and can reach up to 9 feet in diameter. Its needles are flat, short, and rounded, and their dark green top surfaces contrast with the bottom surface, which is dominated by two white parallel stripes. These needles are arranged in a spiral, but twist around at the base in order to form two flat rows. The hemlock is monoecious, meaning that it has male and female cones- male cones are small, yellow, and appear at the bases of needles, whereas female cones are purple, brown when they mature, and situated terminally on branches. 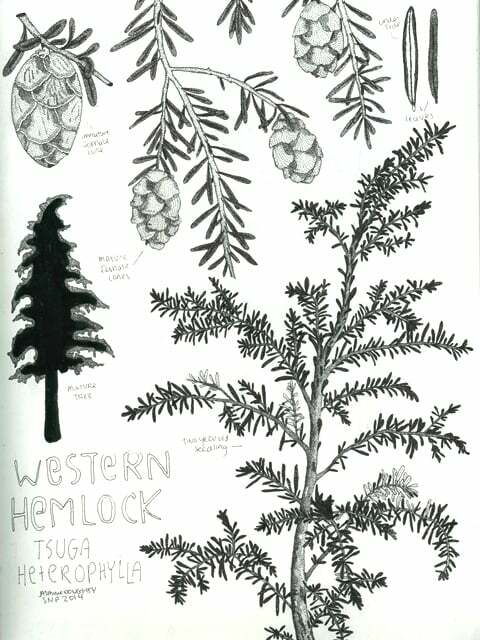 Preferring high humidity and precipitation, the Western Hemlock tends to grow near the Pacific coast, and its native range reaches from the northern end of California to the southern tip of Alaska. It can be found in a range of elevations, from sea level up to 7000 feet. Seedling growth starts out very slow, and young plants often grow from nurse logs and other coarse woody debris. Because of the species’ tolerance for shade, these hemlocks are able to establish themselves under a thick canopy until a gap can be exploited, which leads to rapid growth and the shading out of other less-shade tolerant plants. This makes the species a late-succession specialist, which thrives in areas where fires, which would restart succession, are actively suppressed by human intervention. In addition, these trees are long lived, with recorded individuals of up to 1200 years. The Western Hemlock has been used in the timber industry, which is a major reason for its introduction to temperate areas outside of its native range, such as the eastern United States and western Europe. Its cambium is edible, and fresh needles can be brewed to make a bitter but vitamin c-rich tea. The tree also forms ectomycorrhizal relationships with edible fungus, such as several chantrelle species, so it’s a good one to keep an eye out for while mushroom hunting. For current availability of Western hemlock, click here. This gooseberry is a member of the Ribes family, and can be found throughout temperate regions of North America all the way from sea level to subalpine elevations. It is known to grow in a wide variety of habitats, which include slopes, swamps, stream banks, open woodlands, forest margins, and rock outcroppings. Nitrogen rich and relatively wet soils are preferred by this plant. The plant itself is a deciduous shrub that is erect to spreading, with reddish brown bark on older areas of the stem and branches. It grows .5 to 2 meters high, and all branches and stems are covered with sharp yellowish spines, which are generally small except at nodes, where they are several times longer. 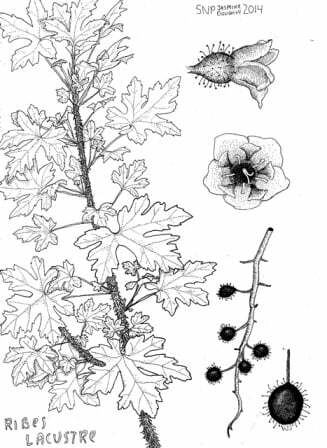 The leaves are a variant on the characteristic Ribes leaf-shape, with palmate, toothed lobes. The small, geometrically beautiful flowers are arranged in a hanging raceme, and tend to be pinkish to maroon. Though covered in a thin layer of black hairs, this plant’s dark purple to black berries are edible and tart, and can be eaten raw or cooked. For current availability of swamp gooseberry, click here. 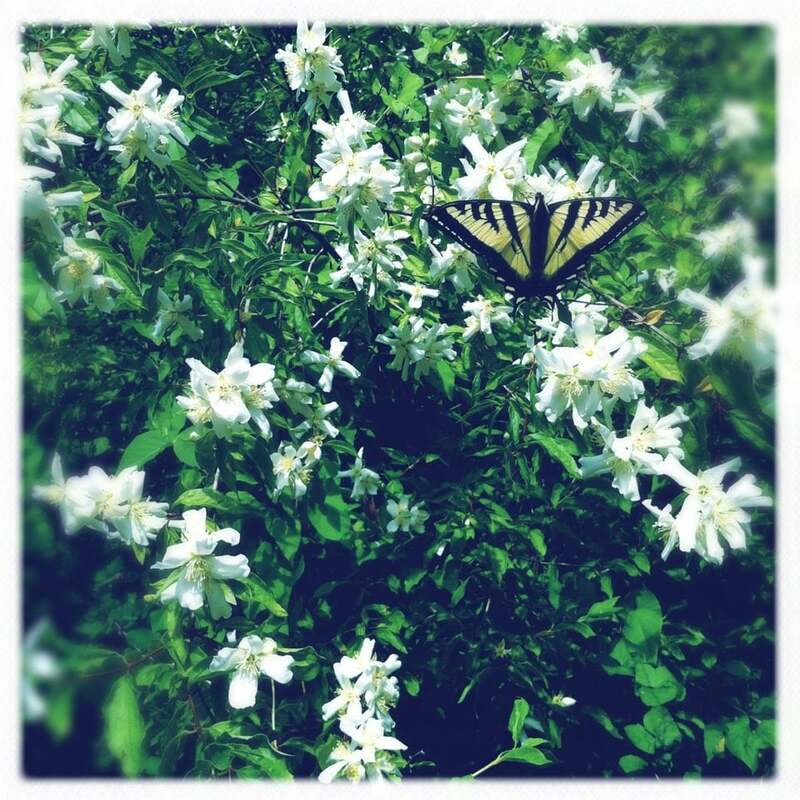 Mock orange grows wild from Southern British Columbia to Northern California and east to Montana, but is possibly better known for its use in landscaping. This hardy shrub produces blooms with an amazing sweet, citrusy scent that attracts pollinators of all kinds. Hummingbirds, certain kinds of butterflies and especially bees flock to this plant in late spring. Birds that eat the seeds include quail, juncos, thrushes, chickadees, grosbeak and finches. Deer and elk are known to browse the foliage but it is a more important food source for mule deer. The dense foliage provides shade for large animals such as deer and elk, as well as for smaller mammals and birds. Humans appreciate how easy it is to grow. Mock orange takes well to pruning, well-suited for summer hedges or as a component of a hedgerow. Mock orange is a deciduous shrub growing up to 10ft tall and nearly as wide. It has opposite, ovate leaves with 3 prominent veins and pointed tips. The young leaves have edges with widely spaced, blunt teeth that disappear as they age. The brown bark becomes somewhat flaky with age. The white flowers have 4 petals and numerous stamens, creating a contrasting yellow center. The flowers appear in clusters at the ends of the lateral branches between May-July. The sepals persist for quite some time after the petals have fallen off creating an additional element of visual interest. The seeds develop inside a woody, 4-chambered capsule about 1cm long in fall.